If you read our Real Estate Forecast for 2012 last week, you might have noticed that it did not specifically address expectations for new home construction in Tallahassee in the coming year. 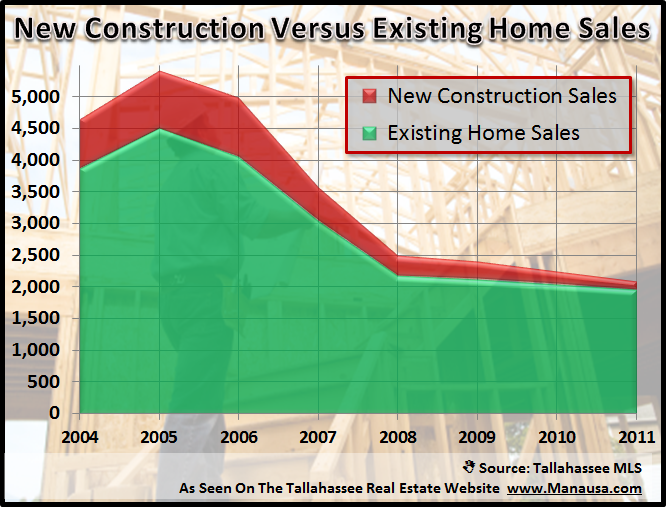 Home builders in Tallahassee have been struggling through some very tough years since the collapse of the housing market, and I see few reasons why next year should provide any kind of relief. Supply levels are still too high, though they are lower than they have been since 2008. The first half of 2012 is going to provide critical feedback to the new home construction industry in Tallahassee. Will there be a rush of homes move from the shadow inventory to the open market and increase the number of homes for sale in Tallahassee? Or have we been overly concerned about the return of the scores of homeowners who failed to sell their homes in the past? In the real estate graph above, the green areas shows the number of existing home sales each year, while the red area shows the new home construction sales in Tallahassee each year. It appears as if 2011 will be the worst year on record, though our 2011 measurements currently go through December 15. A strong year-end closing run could turn it from the worst-year ever to just "a really terrible year" for new home builders. 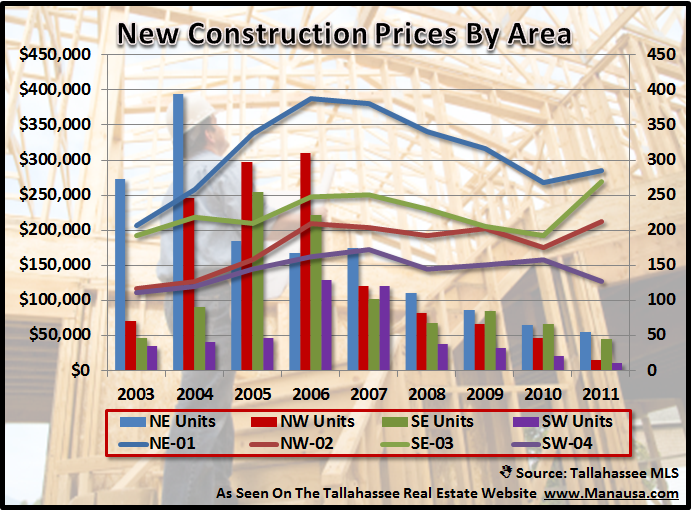 One good sign for the return to a healthy new home construction industry in Tallahassee is that prices are on the rise. For many years, we were seeing new home prices fall because much of these sales were liquidation or sell-offs, as builders had over-estimated demand for the Tallahassee real estate market. As we can see from the graph above, three out of the four quadrants of Leon County are experiencing a rise in new home prices. These areas account for 92% of the new home construction sales in Tallahassee, and that should mean that we are no longer building beyond the limited demand for new home construction in Tallahassee.